All Dressed Up! Little Black Dressing Co. If your New Year’s Resolution was to fit into a little black dress this spring, I may have found the local solution that will help you achieve that goal. Little Black Dressing Co. is a locally owned salad dressing company led by the fervent and fit female entrepreneur, Kissie Stroupe. I met Stroupe in downtown Greensboro soon after the first of year to hear firsthand about her story, her business and talk about New Year’s resolutions. Stroupe rolled into the Green Bean like a ball of energy from her CrossFit workout in High Point. Through her bright and spirited personality she shared how she turned a family recipe into a successful small business, her plans to develop in 2013 and—on top of her successes—how she stays so fit while raising four children and running across the state delivering her signature salad dressing. Stroupe grew up in High Point and was raised by a family who loved cooking and eating. In fact, her high school nickname was “Chow Hog” in reference to how much she loved to eat! After studying graphic design at Meredith College in Raleigh, Stroupe returned to High Point to start a family. For 23 years she dedicated herself to full-time motherhood raising her children – the oldest 23 and youngest 14. In 2010, Stroupe had an itch to start something new and was still “Chow Hog” hungry. With the memory of the delicious salads she grew up eating every night as a child and her friend’s appetite for her family salad dressing recipes, she forged the beginning research of starting her own company. With her design skills from Meredith College, she named the business Little Black Dressing Co., knowing that the same impressions from her signature little black dress would come through in her classic yet snazzy salad dressings. She used her expertise in design to create the business logo and color coordinated labels. Her first dressing was her grandmother Nana’s tangy and sweet Dreamy Creamy Vinaigrette. Soon after, she created, designed and branded Honey, It’s Dijon Dill, Far East Flair and her best seller, It Takes Three to Tango – a mix of ranch, thousand island and blue cheese. Little Black Dressing Co. dressings taste homemade and have zero preservatives. Stroupe mixes and bottles in a High Point commercial kitchen and delivers to restaurants, hotels and specialty grocers in North Carolina herself. And, she does grocery store tastings in a little black dresses. In case you are wondering, she owns more than 15 “little black dresses” in all designs and cuts. 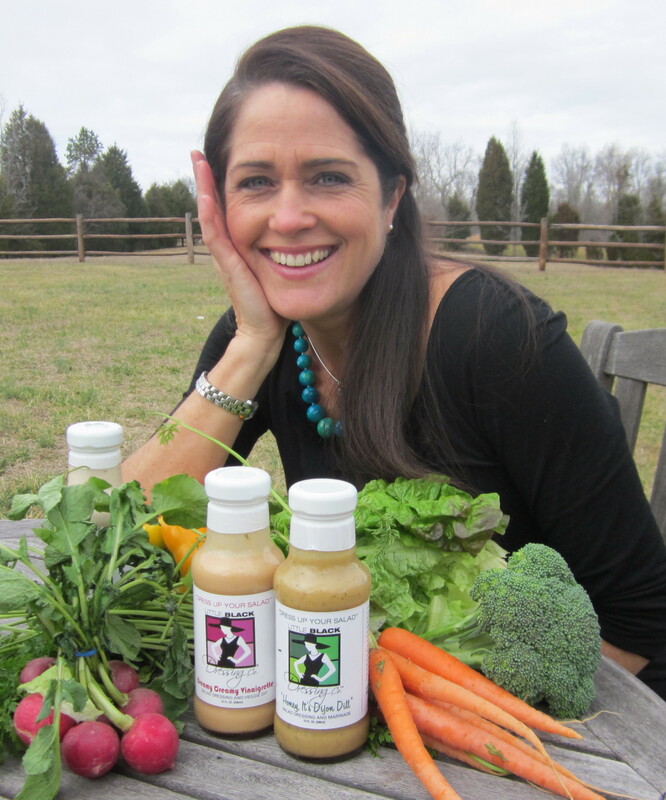 Little Black Dressing Co. is sold in Greensboro at Best Way Grocery and the NY Butcher Shoppe. This summer, the dressings will be added to the shelves at our local Lowes Foods. Take advantage of the season’s best winter vegetables. They are healthy, hearty and perfect for the fitting your New Year’s Resolution! Preheat oven to 400 degrees. Wash beets and wrap individually in foil. Roast about an hour or until tender when pierced. Allow to cool and remove skin my gently rubbing skin. The skin should rub off easily. Chop beets into half-inch cubes and season with salt and pepper. Arrange chopped beets on the bottom of a large salad bowl. 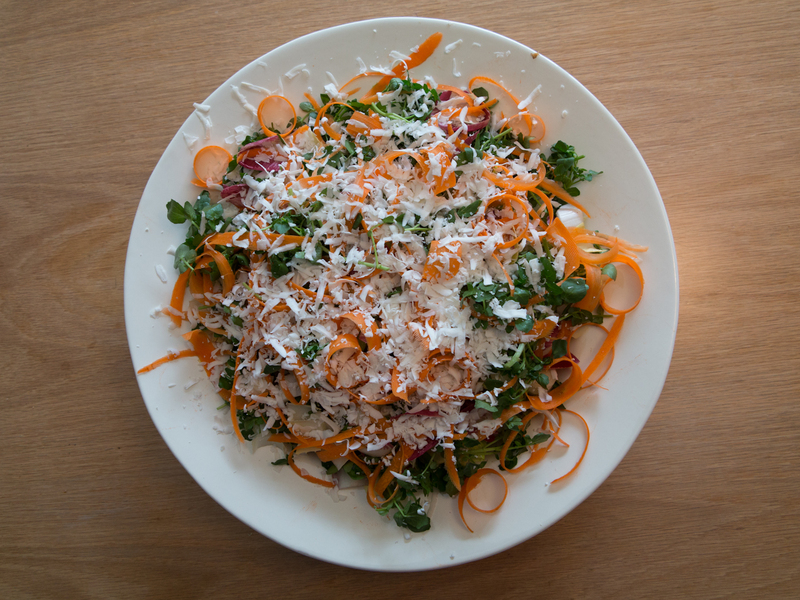 Can you tell me what ricotta salata is that was listed in your recipe for winter vegetable salad?